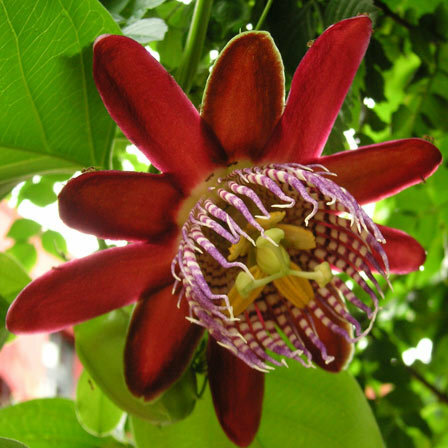 Passiflora (passion flower) is an evergreen climber with beautiful and exotic looking flowers. Early explorers and missionaries of Christianity used the intricate parts of this flower to tell the story of the death of Jesus. According to the legend, the 10 petals and sepals represented the 10 apostles who remained faithful to Jesus throughout the Passion. The filaments symbolized the crown of thorns that Jesus wore on the day of His death. The plant also bears brightly coloured fruits which are relished by the local people. Alba is a strikingly beautiful pure white passion flower with yellow anthers. 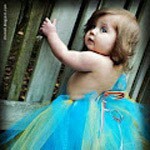 It is 2 to 3 inches wide and has exotic floral appendages and frills. 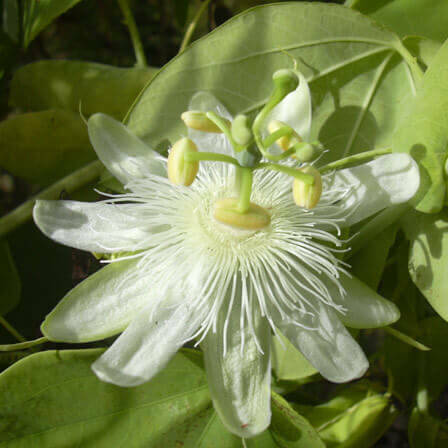 This flower produces edible fruits which are used for preparing jams and chutnies. It is the hardiest passion flower and can easily survive moderately cold winters. 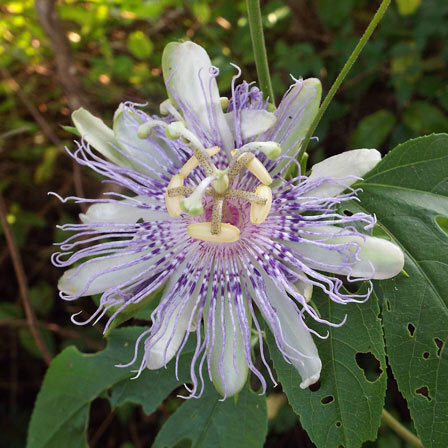 Maypop is a 4 inches passion flower with pink and purple petals. The petals and sepals are fringed and slightly wavy. It appears yearly in summer and early fall and lasts for about a week. The leaves have 3 lobes and smooth margins. It produces ovoid green fruits which can be found on the vine along the flower. 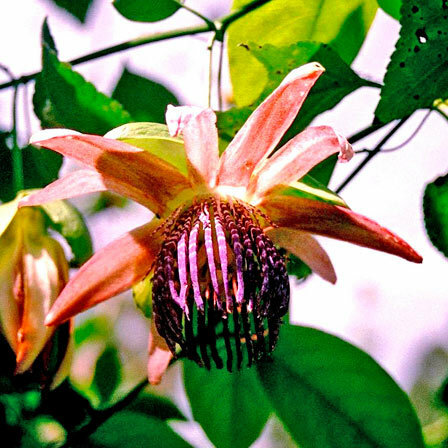 Alata is a highly fragrant Passiflora with red curved petals and a prominent fringed corona in purple and white stripes. Its leaves are long and bright green in colour. Its egg shaped, yellow fruit is highly prized by the local people. Alata blooms yearly in late summer and early fall in proper sunlight. 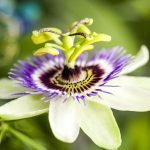 Caerulea is called the king of Passiflora. This white flower is about 10 cm in diameter and is surmounted by a corona of violet filaments. It has deeply lobed dark green leaves that are spread like a hand. The base of each leaf has a tendril which twines around supporting the vegetation. Passiflora vitifolia is native to Southern and North Western America. 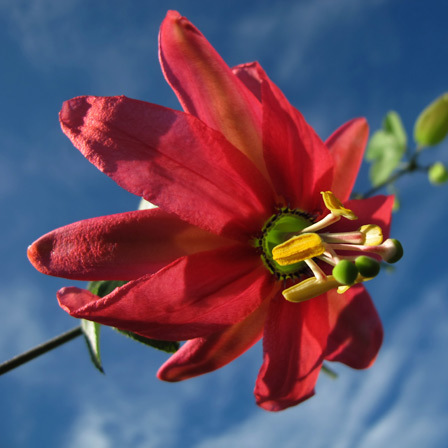 It is a brilliant reddish orange flower with bright red filaments. The flowers are followed by yellow speckled, bright green passion fruits. Its stems are slender and have coiling tendrils. 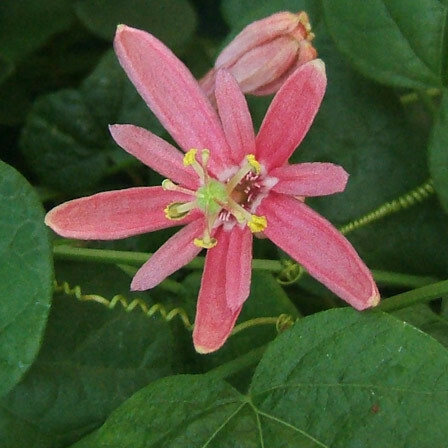 Coral Sea is a 3 inches wide flower with coral pink petals and a small purple filament. This hybrid of manicata was created by Patrick Worley in 1983. Its lush medium green leaves have broad lobes. The flower develops best in shaded location but requires good sunlight to bloom well. Sanguinolenta is vigorous growing vine with 2 large leaves that look like a pair of butterfly wings. Its dark coral pink buds look like candles nestled in the foliage which opens to reveal a delicate wide reflexed coral pink flower. It grows only 9 inches tall, much less than most of the passion vines. It is a perfect vine for smaller gardens and containers. 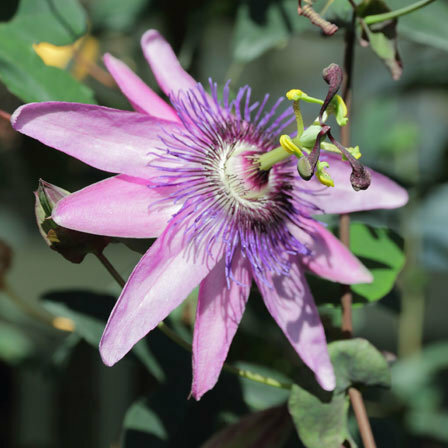 Lavender Lady is a 3 inches wide, deep blue passion flower with three lobed leaves. It was hybridized by the American plant breeder Patrick Worley in 1982. It is a complex hybrid between purple Passiflora amethystina and the blue passionflower, Passiflora caerulea. The petals are darkest at the tips and nearly white at the center, surrounded by erect stamens and filaments in different shades of purple. The flower blooms throughout the year, the peak blossom season being spring and fall. Purple Tiger is a huge crimson red flower with purple and white corona filaments which are wavy towards the tips. 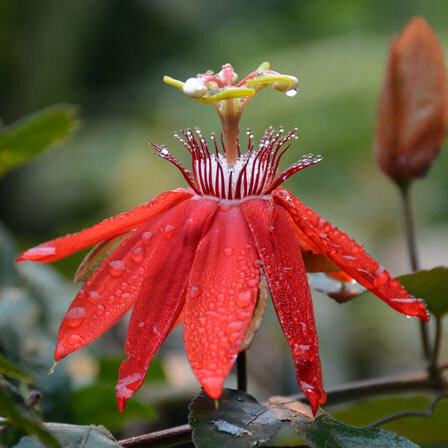 It is a hybrid between Passiflora Ruby Glow and Passiflora Quadrangular. The flower has large rounded waxy leaves with winged stems. 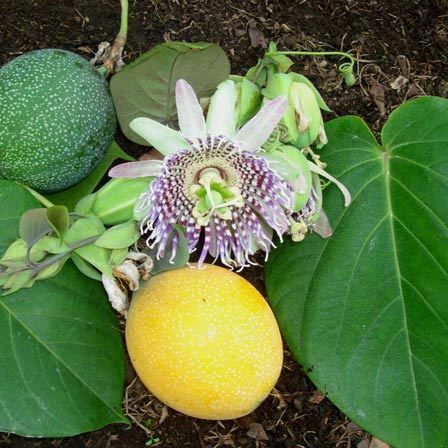 The plant bears large yellow a fruit which does not have a very pleasing taste. 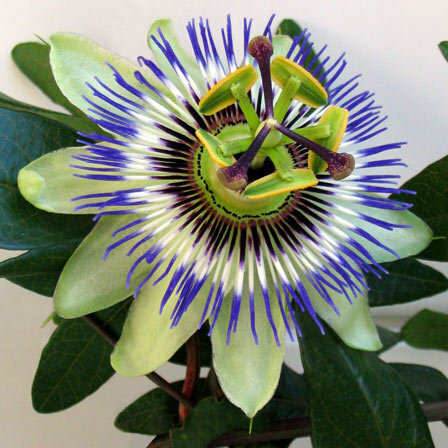 Ligularis is a medium green coloured passion flower with huge heart shaped leaves. The flower has greenish white sepals and light pinkish white petals. Its fruits are orange coloured with purple markings. The fruits can be eaten right out of the shell or the pulp can be extracted to make a refreshing drink. 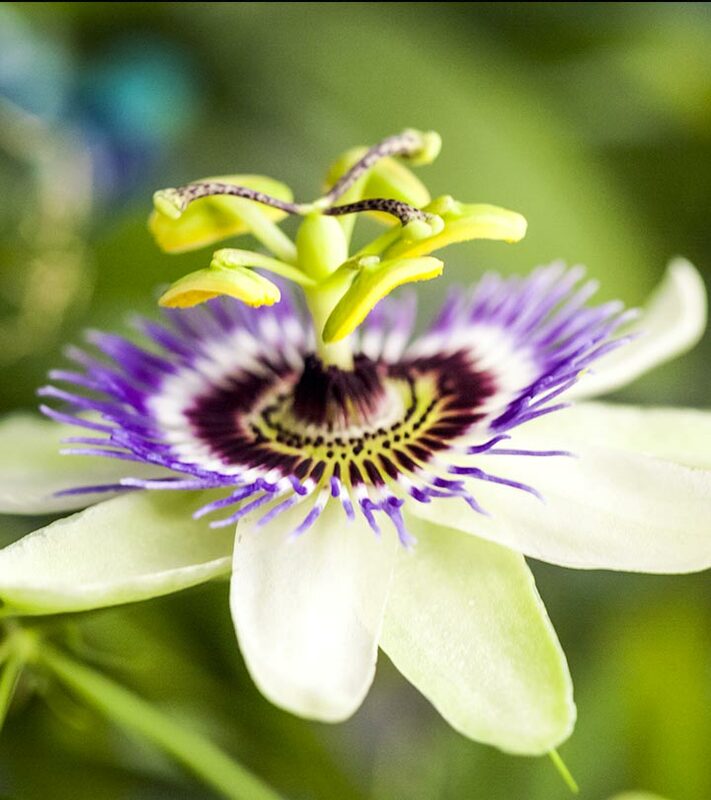 With so many choices to work with, do tell us in the comment section which of the passion flowers you’ve tried planting in your garden. And do remember to share some tips too!